The Royal Conservatory of Music provides a widely recognized standard of music assessment for students in both Canada and the United States. The curriculum helps students excel by supporting their physical (technical) and aural development, musical literacy, and performance skills. The RCM Certificate Program provides structure for recognizing student achievement by allowing students to partake in examinations at each level of musical study. This helps with goal-setting, motivating student practicing, and building confidence! Each Piano Preparatory (Prep A and Prep B) Level, as well as Levels 1 - 10 include contemporary music, popular pieces, jazz, and classical. The 2015 syllabus update includes many new pieces that are being featured for the first time in RCM materials. It is a very exciting update! Learn more about the ​Royal Conservatory of Music. 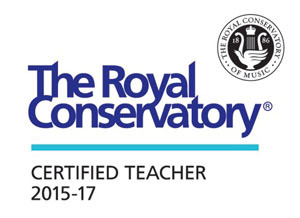 Learn With Our RCM Trained Teachers! Our instructor's hold various certifications and advanced credentials in piano education. We have seen our students' confidence grow as they set goals, prepare for exams, and succeed! Contact Piano Expressions today to begin lessons with one of our qualified instructors!